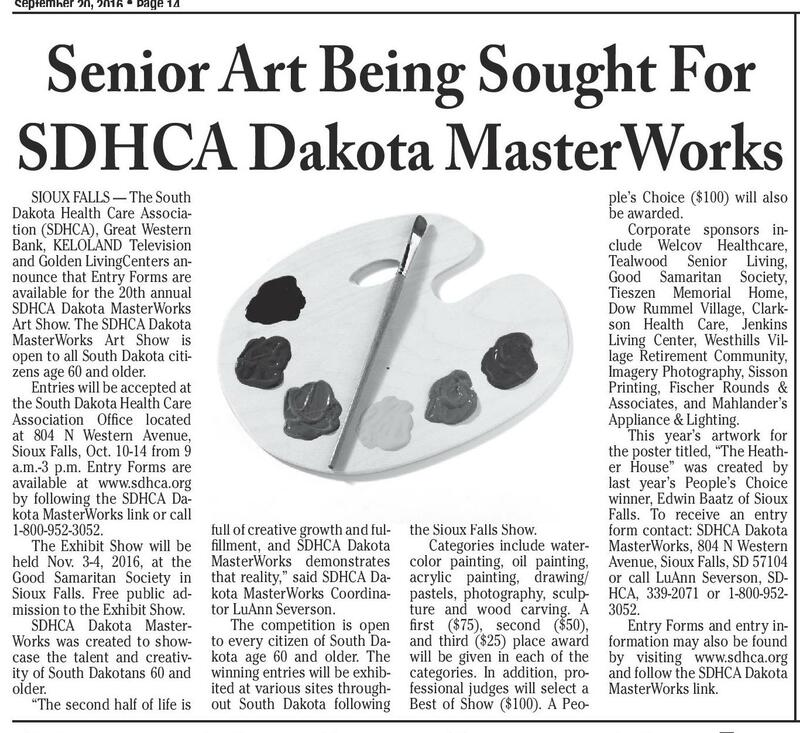 September 20, 2016 • Page 14 shop online at www.missourivalleyshopper.com Senior Art Being Sought For SDHCA Dakota MasterWorks SIOUX FALLS — The South Dakota Health Care Association (SDHCA), Great Western Bank, KELOLAND Television and Golden LivingCenters announce that Entry Forms are available for the 20th annual SDHCA Dakota MasterWorks Art Show. The SDHCA Dakota MasterWorks Art Show is open to all South Dakota citizens age 60 and older. Entries will be accepted at the South Dakota Health Care Association Office located at 804 N Western Avenue, Sioux Falls, Oct. 10-14 from 9 a.m.-3 p.m. Entry Forms are available at www.sdhca.org by following the SDHCA Dakota MasterWorks link or call 1-800-952-3052. The Exhibit Show will be held Nov. 3-4, 2016, at the Good Samaritan Society in Sioux Falls. Free public admission to the Exhibit Show. SDHCA Dakota MasterWorks was created to showcase the talent and creativity of South Dakotans 60 and older. “The second half of life is full of creative growth and fulfillment, and SDHCA Dakota MasterWorks demonstrates that reality,” said SDHCA Dakota MasterWorks Coordinator LuAnn Severson. The competition is open to every citizen of South Dakota age 60 and older. The winning entries will be exhibited at various sites throughout South Dakota following the Sioux Falls Show. Categories include watercolor painting, oil painting, acrylic painting, drawing/ pastels, photography, sculpture and wood carving. A first ($75), second ($50), and third ($25) place award will be given in each of the categories. In addition, professional judges will select a Best of Show ($100). A Peo- ple’s Choice ($100) will also be awarded. Corporate sponsors include Welcov Healthcare, Tealwood Senior Living, Good Samaritan Society, Tieszen Memorial Home, Dow Rummel Village, Clarkson Health Care, Jenkins Living Center, Westhills Village Retirement Community, Imagery Photography, Sisson Printing, Fischer Rounds & Associates, and Mahlander’s Appliance & Lighting. This year’s artwork for the poster titled, “The Heather House” was created by last year’s People’s Choice winner, Edwin Baatz of Sioux Falls. To receive an entry form contact: SDHCA Dakota MasterWorks, 804 N Western Avenue, Sioux Falls, SD 57104 or call LuAnn Severson, SDHCA, 339-2071 or 1-800-9523052. Entry Forms and entry information may also be found by visiting www.sdhca.org and follow the SDHCA Dakota MasterWorks link. Exchange Rates and Effect on U.S. Sheep BROOKINGS, S.D. - While New Zealand sheep producers reduce numbers due to drought, U.S. sheep producers are waiting to see if the decrease in worldwide supply impacts prices locally. “The U.S. imports more than 90 percent of the lamb and mutton consumed from New Zealand and Australia,” said Dave Ollila, SDSU Extension Sheep Field Specialist. “Imports of lamb have offset the decline in domestic production in recent years. 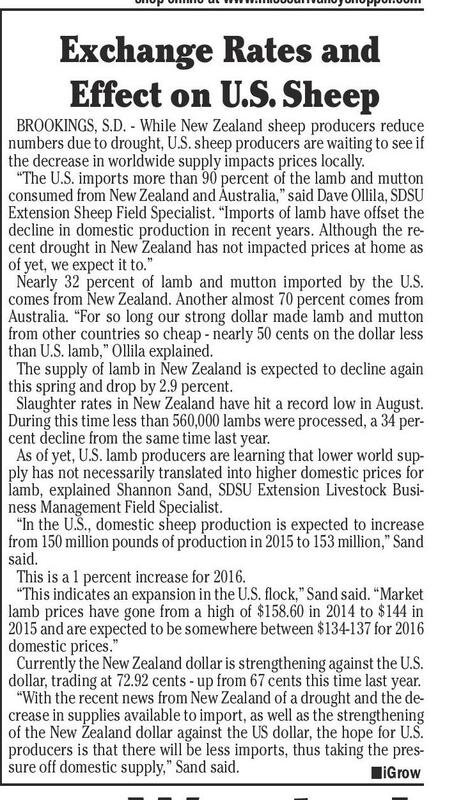 Although the recent drought in New Zealand has not impacted prices at home as of yet, we expect it to.” Nearly 32 percent of lamb and mutton imported by the U.S. comes from New Zealand. Another almost 70 percent comes from Australia. “For so long our strong dollar made lamb and mutton from other countries so cheap - nearly 50 cents on the dollar less than U.S. lamb,” Ollila explained. The supply of lamb in New Zealand is expected to decline again this spring and drop by 2.9 percent. Slaughter rates in New Zealand have hit a record low in August. During this time less than 560,000 lambs were processed, a 34 percent decline from the same time last year. As of yet, U.S. lamb producers are learning that lower world supply has not necessarily translated into higher domestic prices for lamb, explained Shannon Sand, SDSU Extension Livestock Business Management Field Specialist. “In the U.S., domestic sheep production is expected to increase from 150 million pounds of production in 2015 to 153 million,” Sand said. This is a 1 percent increase for 2016. “This indicates an expansion in the U.S. flock,” Sand said. “Market lamb prices have gone from a high of $158.60 in 2014 to $144 in 2015 and are expected to be somewhere between $134-137 for 2016 domestic prices.” Currently the New Zealand dollar is strengthening against the U.S. dollar, trading at 72.92 cents - up from 67 cents this time last year. “With the recent news from New Zealand of a drought and the decrease in supplies available to import, as well as the strengthening of the New Zealand dollar against the US dollar, the hope for U.S. producers is that there will be less imports, thus taking the pressure off domestic supply,” Sand said. niGrow Teen Technology Trainers Wanted BROOKINGS, S.D. - Students teaching adults? It’s a unique role reversal that has occurred in the Spearfish community over the past year - and it has been met with much success, according to Leacey E. Brown, SDSU Extension Gerontology Field Specialist. “Young people are taking time to share their smart phone and iPad technology expertise with adults 50 to 60 years their senior, and the adults are getting the hang of it,” explained Brown. The program is called TeachSD. TeachSD is an intergenerational technology program which was created by SDSU Extension and launched as a pilot project in Spearfish in May 2015. SDSU Extension is currently recruiting young people to become TeachSD Technology Trainers to bring the program to more communities across the state. A training is scheduled for October 5, 2016 from 2 p.m. to 5 p.m. (MT) on the Black Hills State University. Technology Trainers may be part of youth groups (churches, clubs, etc.). Young people must attend the TeachSD Technology Trainer Seminar offered by SDSU Extension. “This is a great opportunity for teens to learn about aging, disability, experiential learning, learning styles and strategies to teach older adults to use technology,” Brown said. After completing the training, attendees will be prepared to offer adult learners individualized technology lessons. To learn more and register, call Brown at 605.394.1722. More about TeachSD To date, the TeachSD technology trainers have provided over 50 hours of service to adults in Spearfish since the pilot began. Technology trainers include Lawrence County teens Bridger Gordon, Ally Jilek, Anna Pochop, and Noah Pochop. Brown said that the adult students often came with questions about cell phones, iPads, laptops, and social media. “After an hour-long session working one-on-one with a teenage teacher, many participants acknowledged they had a better understanding of using Facebook, texting and the features of their smart phone,” she explained. “The goal of the program is to help adults become more comfortable with technology which may help them maintain their independence and bolster their ability to communicate with their family and friends via technology.” Student trainer, Bridger Gordon said he was interested to see the array of things the adults wanted to learn. “One gentleman I helped wanted to know how to create folders on his cell phone so he could organize his pictures,” Gordon explained. “Another adult learner who attended several sessions often arrived with a list of technology questions.” Overall, Brown said the technology trainers enjoyed working with adults, and the adult participants knew more about technology than they expected. “The young people said they also learned more about technology because of the things the adults wanted to learn,” Brown said. Kindra Gordon, who served as the Technology Trainer Youth Adviser, calls the project extremely rewarding - for both the students and adults. 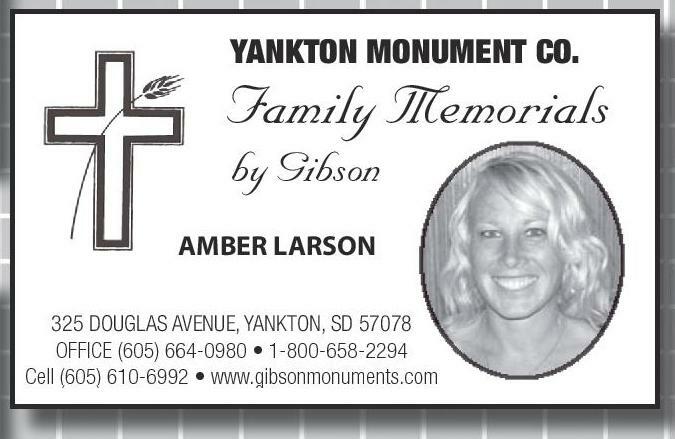 “It was neat to see someone in their 70’s send their first text or Facebook message to a grandchild and the look on their face when they got a message response from that family member,” Kindra said. “As well, it was rewarding to see the students put in a position of being appreciated for the skills and knowledge they could offer. It was a confidence booster for them.” Kindra also says the project provided many lessons in communication. “The students had to learn to communicate at a pace and in terms that the adults could understand, and the adults had to communicate what issue they were trying to solve,” she said. “But in addition to that, there was an opportunity for conversations to develop about everyday life. It really helped build some connections between the two generations.” niGrow TeachSD technology trainers (left to right) Bridger Gordon, Ally Jilek, Anna Pochop, and Noah Pochop have provided over 50 hours of service to adults in Spearfish since the pilot began. 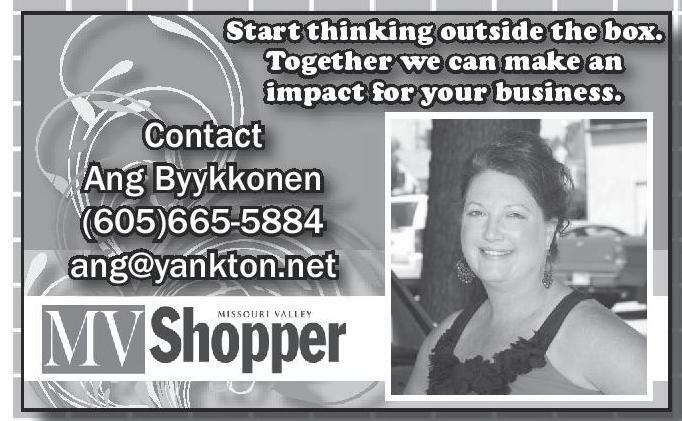 Keep the numbers of these locally owned businesses on hand for all your service and shopping needs. Start thinking outside the box. Together we can make an impact for your business. 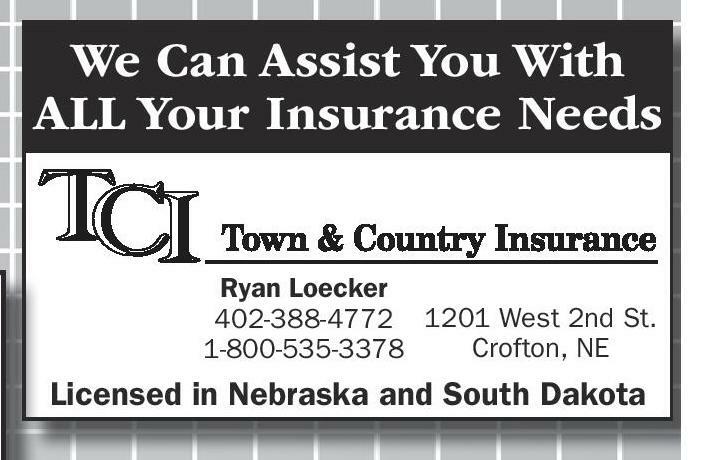 We Can Assist You With ALL Your Insurance Needs Contact Ang Byykkonen (605)665-5884 ang@yankton.net Ryan Loecker 402-388-4772 1201 West 2nd St. Crofton, NE 1-800-535-3378 YANKTON MONUMENT CO. Family Memorials by Gibson Licensed in Nebraska and South Dakota AMBER LARSON imagine... A TOTAL TRANSFORMATION SHUTTERS SIDING GUTTERS DOORS WINDOWS 325 DOUGLAS AVENUE, YANKTON, SD 57078 OFFICE (605) 664-0980 • 1-800-658-2294 Cell (605) 610-6992 • www.gibsonmonuments.com MENTION THIS AD & RECEIVE $1000 OFF JR’s Auto Repair Located: From Hartington 4 miles West on Hwy 84 and 2 miles South 88005 559 Ave. Hartington, NE 68739 402-254-9235 CALL TYLER LEINBAUGH Free In-Home Estimates 7 12-276-5588 1303 Zenith Drive - Sioux City, IA 51103 Serving You With All Your Auto Repair Needs! 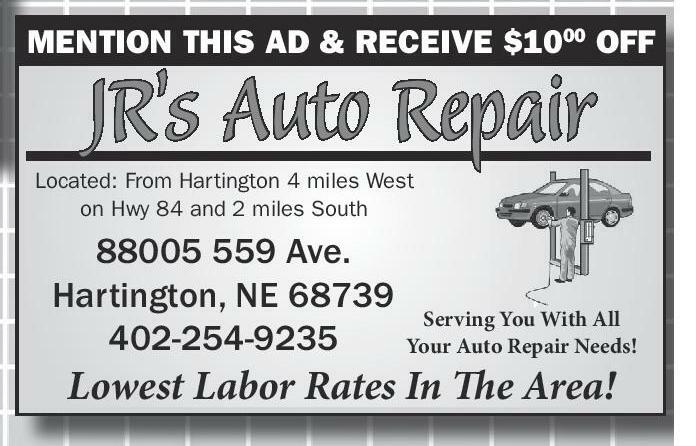 Lowest Labor Rates In The Area! 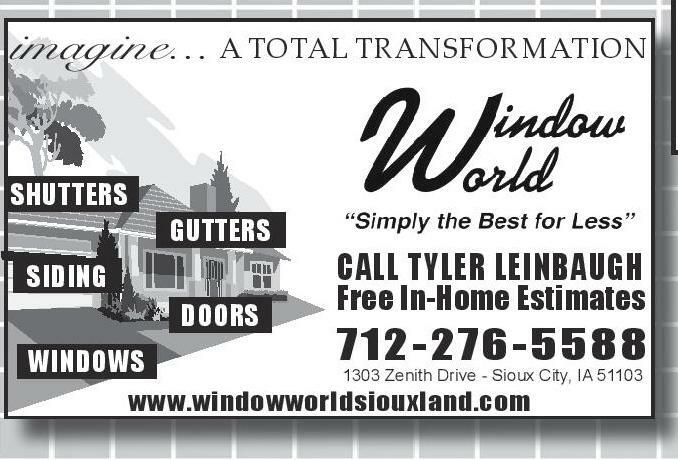 www.windowworldsiouxland.com We’ve committed our “perso nal touch” to serving you! 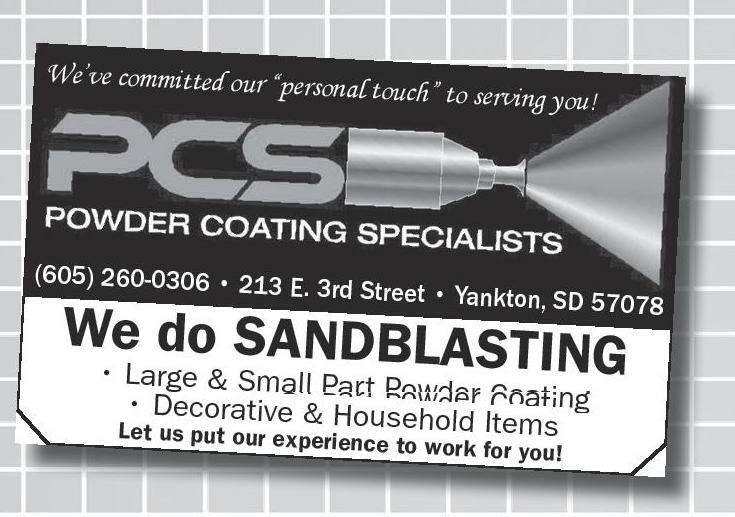 (605) 260-0306 • 213 E. pany National Coin Com1967 rs Full Time Since 3rd Street • Yankton, SD Serving Collecto 57078 We do SANDBLASTING • Large & Small Part Po wd • Decorative & Househ er Coating old Items Let us put our experience to work for you! 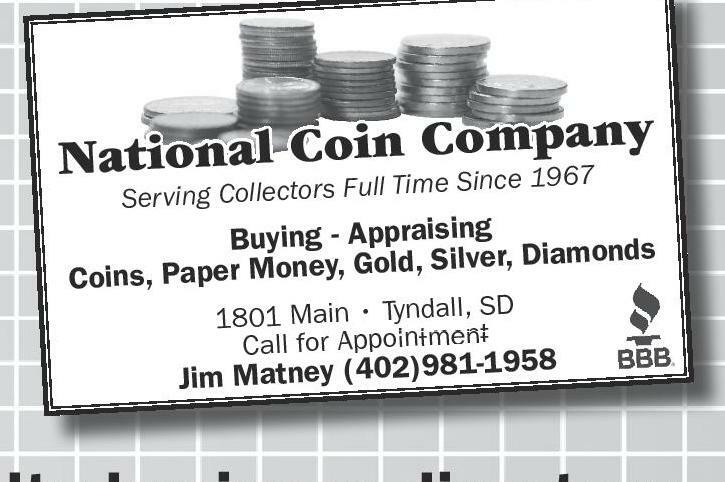 Buying - Appraising Diamonds r Money, Gold, Silver, Coins, Pape 1801 Main • Tyndall, SD Call for Appointment -1958 Jim Matney (402)981 To advertise in our next specialty business directory, call the Missouri Valley Shopper at 605-665-5884.